Finished embroidery: my doll’s house Christmas tree mat kits are now on sale! A few weeks back, I showed off a picture of the first of my new Christmas tree mat designs for doll’s houses, as soon as it was stitched up. At the time, I said I’d let people know when the range was ready to be launched. Well, today’s the day! There are three designs in various diameters, to suit several sizes of miniature Christmas tree. They are all to be stitched on 32 count silk gauze, with one strand of Anchor stranded cotton, in tent stitch. The kits come with a colour block chart (the design is not printed on the fabric), and full instructions, including how to neatly finish the edge of the mat. 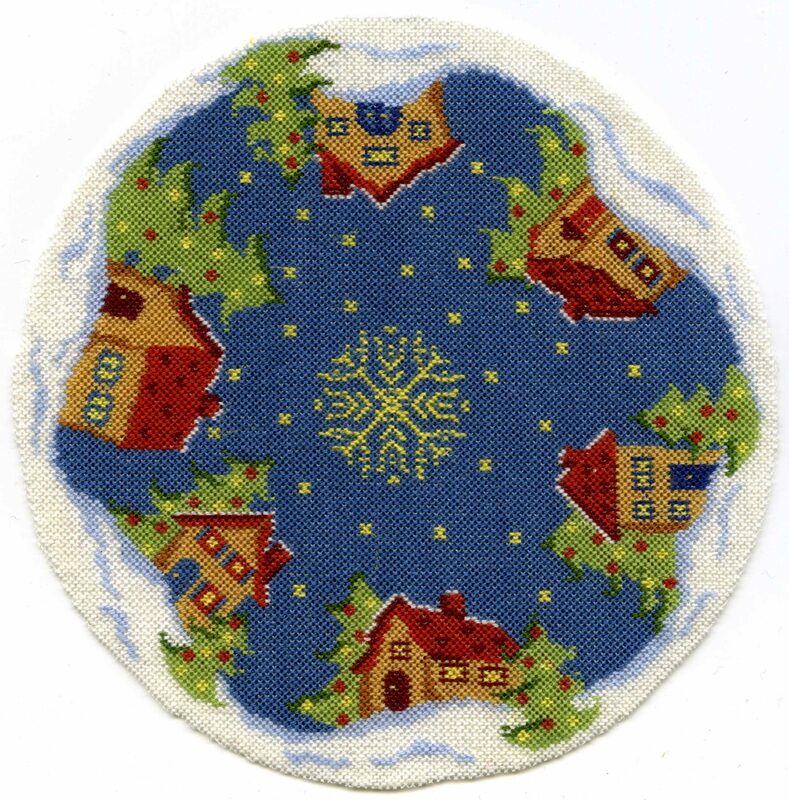 The ‘Snowy village’ design will have a matching Christmas stocking design available soon, and I’m working on matching designs for the other two. The ‘Snowy village’ kit costs £18.95, and the two larger kits cost £19.95 each. Shipping is free worldwide on all orders over £10. 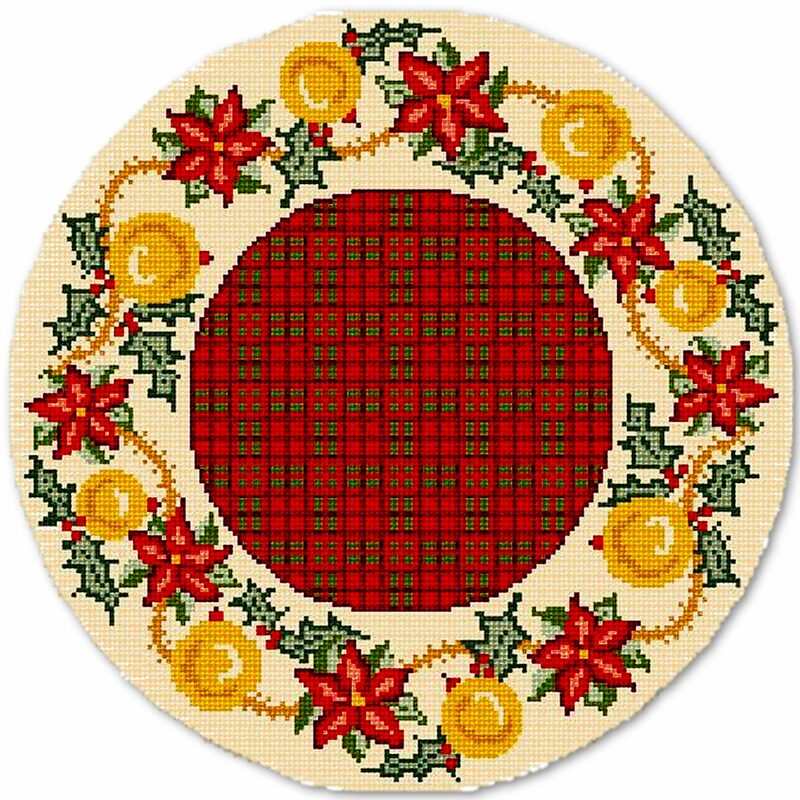 There is a free online tutorial available, which shows exactly how to stitch and assemble the Christmas tree mats. Author Janet GrangerPosted on September 29, 2010 March 5, 2012 Categories Christmas, Christmas tree matsTags Christmas, Crafts, Doll's house, Doll's house embroidery, Doll's house furniture, Dollhouse, Embroidery, Finished embroidery, Hand embroidery, Miniature needlepoint, Tent stitchLeave a comment on Finished embroidery: my doll’s house Christmas tree mat kits are now on sale! 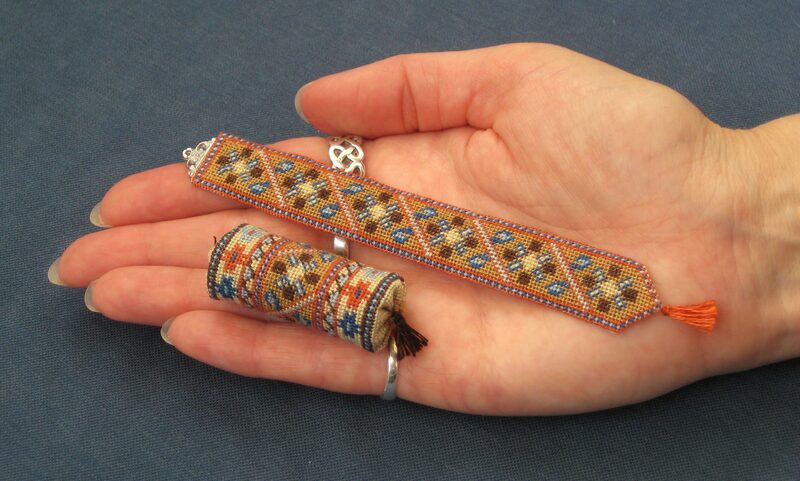 The bellpull is 4 1/2 inches long, and the bolster cushion is 1 1/2 inches long and 5/8 inches diameter. Both of them are stitched in needlepoint (like half cross stitch) using one strand of Anchor stranded cotton. The bellpull kits are £9.95 each, and the bolster cushion kits are £12.95 each. Kits for each of them are available from my website – for bellpulls look here, and for bolster cushions, look here. 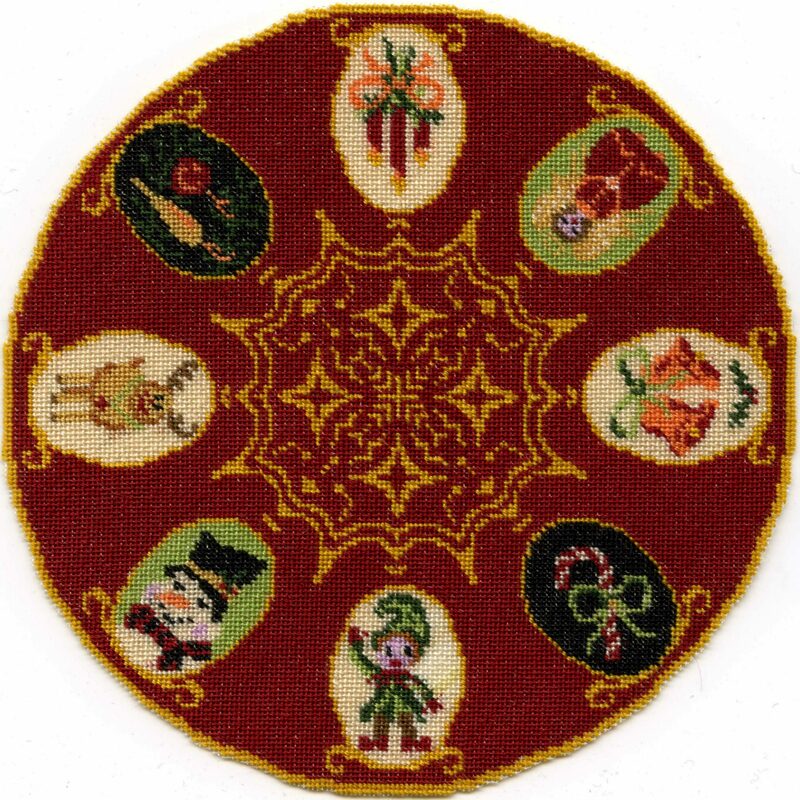 There are free online tutorials for each type of miniature needlepoint kit (and many others) – see here for details. Seven new kits have just been launched on my website – cute little bolster cushions for your doll’s house. They measure just an inch and a half long, by five eighths diameter.You can choose from floral, ethnic or ‘all-over’ designs, in pastels and brights. Each bolster is to be worked on 32 count silk gauze, and is designed to be really simple to do. Everything you need is included in the kit, from the silk gauze and Anchor stranded cotton (floss), to detailed making up instructions with diagrams, wadding, and a suitable needle. As usual with my kits, a clear colour block chart is included, to count the design from. There are even detailed instructions for how to make the tiny tassels that decorate each end of the bolster! Each bolster kit costs £12.95 , and postage & packing is free worldwide for these kits (as we only charge a flat rate of £1.25 on small orders of less than £10 ). To see the designs, go to the ONLINE SHOP now. If you are a beginner to mini-stitching and are unsure as to whether you would be able to make one of these bolsters, why not have a look at the FREE ONLINE TUTORIAL first? It guides you through every stage of stitching and finishing the bolster cushion, with detailed photos to show you exactly what you need to do. You’ll see just how easy they are to stitch! Go to the BOLSTER CUSHION TUTORIAL now to see how easy they are to make.